Adventures in Stitching: Hello December. Sad news. The replacement camera was only working 24 hours before the lens error of death reared its ugly head again. AND the boy has a raging fever. So not much adventuring has been happening over the past few days. I did start decking the halls, but it's not done yet. Right now I am concentrating on getting everyone healthy again so we can go get a tree this weekend and go hog-wild on the hall-decking. This is one of last year's ornaments. 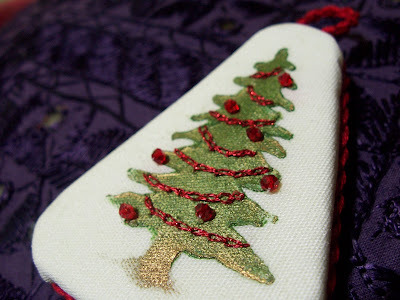 That green and gold tree is painted with shiva paintstiks using a tree stencil, and a quick chain-stitch garland added in red metallic thread and some swarovski bicone ornaments. I think this was one of the fastest ornaments ever made but it doesn't look it. Can't wait to pull out more!